SINGAPORE -- President Moon Jae-in said Friday that one of the foreign ministry officials accompanying him on his trip to Singapore was found unconscious in her hotel room following an apparent stroke. Kim Eun-young, director-general at the ministry's South Asian and Pacific Affairs Bureau, appears to have suffered a cerebral hemorrhage and was rushed to a local hospital, Moon said in a Twitter message. 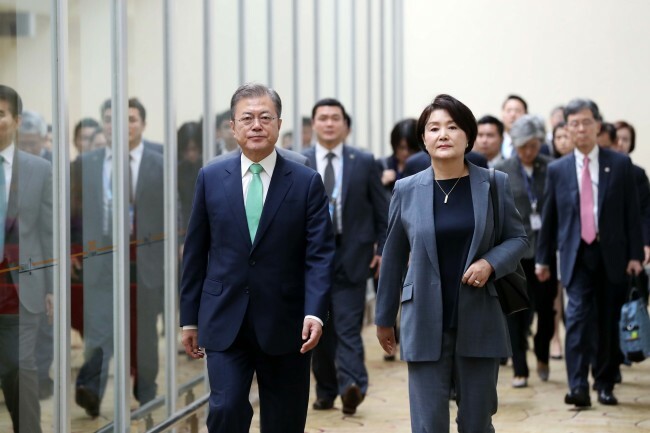 Moon arrived in Singapore for a four-day visit to attend a series of annual regional summits with the Association of Southeast Asian Nations and bilateral meetings with some of the participating leaders on the sidelines. On Friday, Moon left for Papua New Guinea for an Asia Pacific Economic Cooperation summit. "Director-general Kim oversaw all working-level issues related to various ASEAN meetings and APEC meetings," Moon said. "She appears to have overworked. I feel very sorry for her." Moon said he visited Kim at the hospital and was told that her conditions could turn critical due to high brain pressure. Moon also said he directed his doctor to remain in Singapore to help with her treatment.